First, let’s rewrite the original equation to make it easier to work with. Nice! We computed the derivative of a sigmoid! Okay, let’s simplify a bit. s = 1./(1+exp(-x));  % Sigmoid. ds = (exp(-x))./((1+exp(-x)).^2); % Derivative of sigmoid. Looks like a derivative. Good! But wait… there’s more! 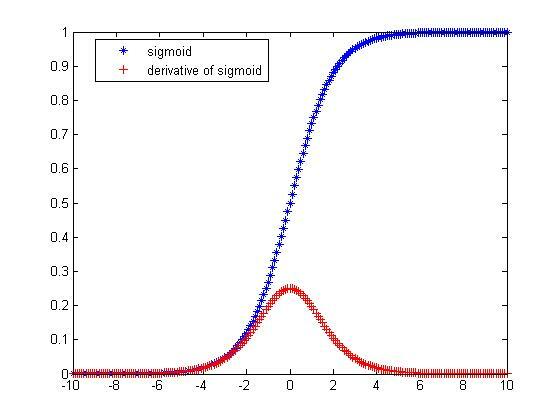 If you’ve been reading some of the neural net literature, you’ve probably come across text that says the derivative of a sigmoid s(x) is equal to s'(x) = s(x)(1-s(x)). So your next question should be, is our derivative we calculated earlier equivalent to s'(x) = s(x)(1-s(x))? How does the derivative of a sigmoid f(z) equal f(z)(1-(f(z))? How does the derivative of a sigmoid s(x) equal s(x)(1-(s(x))? This part is not intuitive… but let’s add and subtract a 1 to the numerator (this does not change the equation).
. Let’s replace them with s(x). And for a sanity check, do they both show the same function? ds1 = s.*(1-s); % Another simpler way to compute the derivative of a sigmoid. So there you go. 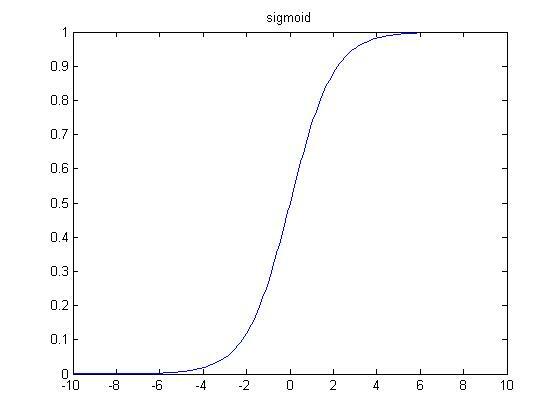 Hopefully this satisfies your mathematical curiosity of why the derivative of a sigmoid s(x) is equal to s'(x) = s(x)(1-s(x)). This shows the derivative having positive x in the exponents. I think if you 1) rewrite my equation so the e^-x in the numerator goes to e^x in the denominator, 2) multiply my equation by e^x/e^x, and 3) expand the denominator in both the wolfram and my equation, they should be equal. Hi Sefrin, could you include an example/link to explain what you mean? Thanks Vinay! You created a nice visual summary of different activation functions. Actually you do use the product rule but it is part of the chain rule. Hope this is clear. Hi Scott, thanks for your comment! I agree this is confusing/misleading. I re-wrote to remove the reference to the product rule. Very nice explanation but you are using the chain rule to differentiate not the product rule. Excellent walkthrough. For a guy just getting into activation fn’s, this really helps! Thanks so much! 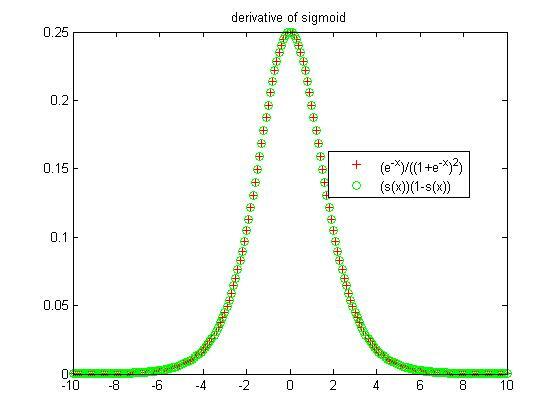 EASILY, the best blog post on finding the derivative of a sigmoid function. You didn’t leave any details out. Took me forever to wrap my head around this. The +1 – 1 thing is definitely not intuitive. Thanks for writing this. Thanks! really helped with Prof. Hinton’s NNML Coursera lecture I was struggling to understand. Very detailed. Thank you !! Thanks much. I was breaking my head on this today. Glad it helped clear things up!